Long ago - before the origin of Buddhism, Yoga and Christianity - there are historical records for the uses of Aswagandha as a healing herb in India. Today, after thousand of years of continuous use, still Aswagandha is regarded as one of the most valuable Ayurvedic medicinal plants. It is a short shrub grows in all dry parts and sub tropical parts of India such as Punjab, Madhya Pradesh, Gujarat, and Rajasthan. It is also found in South Africa, Congo, Egypt, Morocco, Jordan and Afghanistan. It is a short shrub (35-75 cm) with a central stem from which branch extend radially like a star and covered with a dense matte of wooly hairs. The plant also has long brown tuberous roots that are used for medicinal purposes. All chemicals listed pertain to the root unless otherwise specified, as the root is the part used. Anaferine (alkaloid), anahygrine (alkaloid), beta-sisterol, chlorogenic acid (in leaf only), cysteine (in fruit), cuscohygrine (alkaloid), iron, pseudotropine (alkaloid), scopoletin, somniferinine (alkaloid), somniferiene (alkaloid), tropanol (alkaloid), withaferin A (steroidal lactone), withanine (alkaloid), withananine (alkaloid) and withanolides A-Y(steroidal lactones). The main constituents of Aswagandha are alkaloids and steroidal lactones. 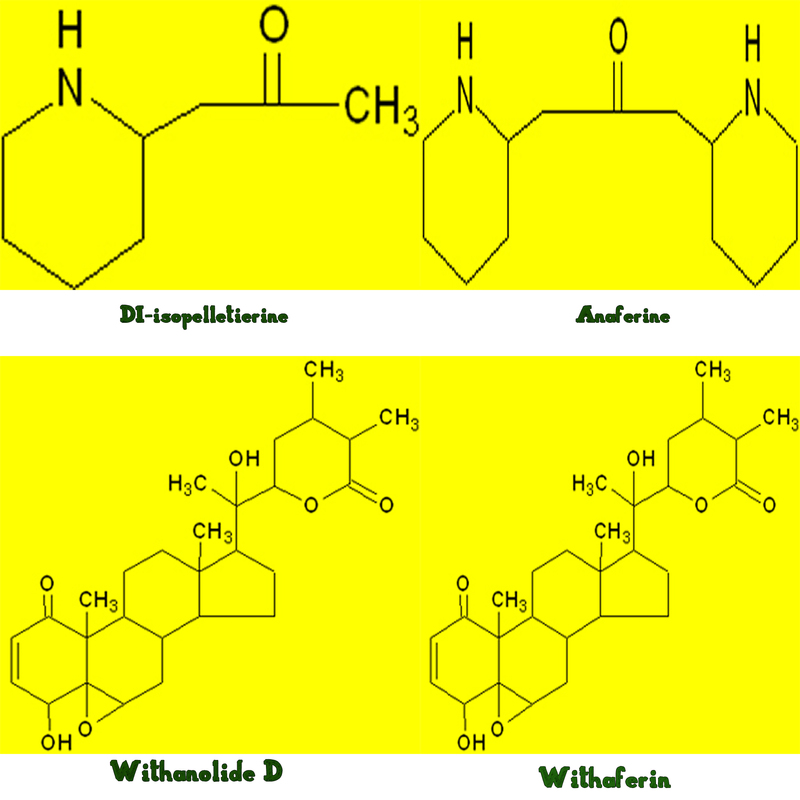 Among the various alkaloids, withanine is the main constituent. The other alkaloids are somniferine, somnine, somniferinine, withananine, pseudo-withanine, tropine, pseudo-tropine, 3-a-gloyloxytropane, choline, cuscohygrine, isopelletierine, anaferine and anahydrine. Two acyl steryl glucoside viz. sitoindoside VII and sitoindoside VIII have been isolated from root. The leaves contain steroidal lactones, which are commonly called withanolides. The withanolides have C28 steroidal nucleus with C9 side chain, having six membered lactone rings.